Back in October 2010, I reviewed the Illusione 888 – Slam and I loved it. Loved it so much that it even made my Top 10 List for 2010. So it was a no brainer to find out which other sizes in the Illusione stables also were available in the Slam version. Enter the Illusione 4/2g Slam. I’m not sure if its the same case as the 888 Slam where a leaf of the filler was removed in order to accomodate the bench press style. With fond memories of the 888 Slam, I was very excited to smoke to acquire and smoke the 4/2g Slam. 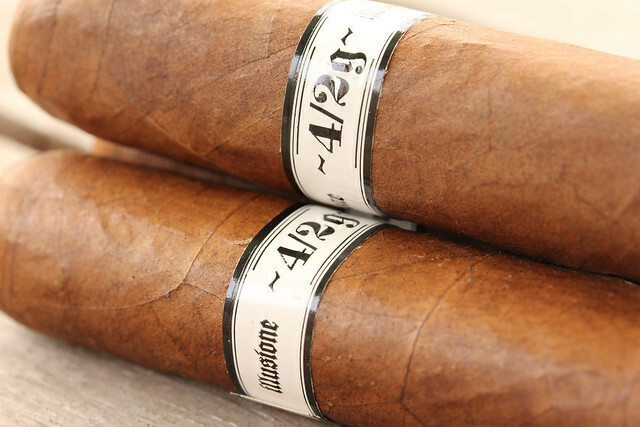 While I won’t say that the Illusione 4/2g Slam is a bad cigar. I really enjoyed the flavors. I thought its core creamy woodsy flavor profile was smooth, balanced and nicely done. The subtle hints of Nicaraguan “zing” were surprising subtle. After consuming the 7.5×49 double corona I was left feeling unsatisfied. While the 4/2g Slam was good and enjoyable I felt like it was missing that signature Dion Giolito element that transforms the cigar from a good “part of the pack” cigar to that great, “leader of the pack” cigar. Enjoyable but with no wow factor. Solid flavor profile but not memorable. Nice review Don. My personal favorit from Illusione is the CG4, great chocolate and coffee flavours! Well done, as usual. The 4/2g is a size my local didn’t bring in and I can’t remember if I’ve ever had one. Your opinion of the slam sounds like my opinion of the MJ12. It is a solid cigar, which I wouldn’t turn down, but it is missing the “wow” factor that other Illusione cigars have. As Dion has stated in many interviews, the narrower ring gauges are better vehicles for flavor and he prefers them. I’ve gone through a box of MK (the best Illusione IMO) and have a box of F9 right now. Compared to the CG:4, 88, and 68, these coronas and lonsdales really let the wrapper shine and the dirty Nicaraguan power come through. After seeing this ‘slam’ I will probably continue to stick to Illusione under 46 guage.